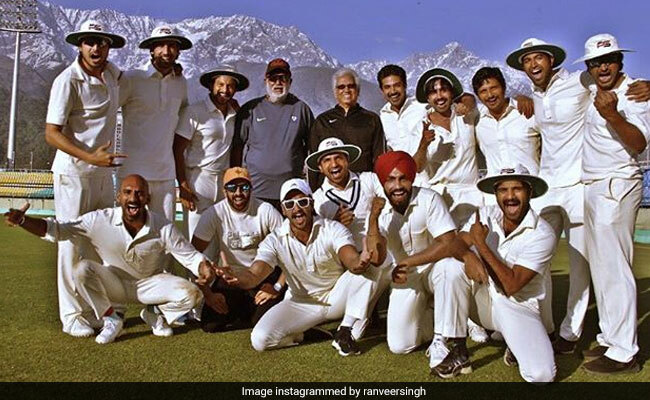 Ranveer Singh, who is currently shooting for the Kabir Khan-directed sports drama '83 in Dharamshala, has been keeping fans updated with intriguing posts from the hill station. On Monday, he shared brand new pictures of the film's team and also spotted were former cricketers Mohinder Amarnath and Balwinder Singh Sandhu, who were part of India's winning team during World Cup 1983. The former cricketers joined the film's set to guide the cast in their recreation of India's iconic 1983 win against West Indies at Lord's Stadium in England. The film's team is expected to fly off to London soon after wrapping their schedule in India. Sharing a new album of photos from '83 sets, Ranveer Singh wrote: "Jimmy! It's the one and only, Champion of Champions, Mohinder Amarnath!" In the photos, Ranveer is dressed as his character from the film - he plays the role of Kapil Dev in '83, who captained India to the World Cup victory. Ealier, Ranveer had shared pictures of himself with Kapil Dev from the Himachal Pradesh Cricket Association Stadium. "Becoming the Hurricane," he captioned one of the posts. '83 also stars actors such as Tahir Raj Bhasin, Saqib Saleem, Ammy Virk, Jiva and Harrdy Sandhu among others. '83 will mark Ranveer Singh's first trilingual film, which will be made in Hindi, Tamil and Telugu. The much talked-about film is expected to hit screens on April 10 next year.